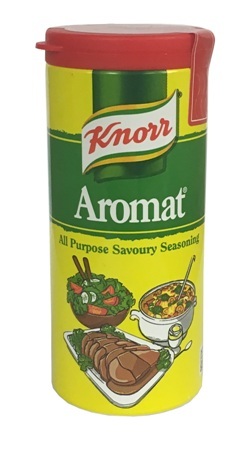 Aromat seasoning is an extremely popular seasoning in South Africa. It can be used to season just about everything, enhancing the taste of poultry, meat, vegetables and seafood. Fantastic stuff. Have used it for years. Delicious. Never heard of it, introduced to me by my boyfriend when he made me cheese on toast and what a delicious snack that was! Unfortunately for him he's now 'Chief' cheese on toast maker!! I've been introduced to this by a friend and have noticed what a massive difference it makes, just one sprinkle on boiled/steamed veg, in soups, in meat, practically everything can have just a sprinkle, even less than salt and it really makes the flavours come out. even if you're still not sold, for under 1.20, you really can't go wrong, surely? ?